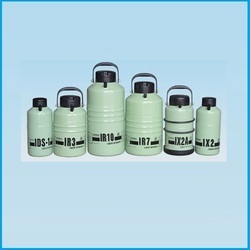 We are manufacturer and supplier of high-quality Liquid Nitrogen Containers from Delhi, India. Our Liquid Nitrogen Containers can be widely used in various organization like labortries, Ice creme manufaturing, IVF Centre and to store semens straw. These Liquid Nitrogen Containers can be customized in nature. We are manufacturing Liquid Nitrogen Containers to various cities like Delhi, Noida, Ghaziabad, Faridabad, Gurgaon, Sonipat, Ambala, Karnal, Bhiwadi, Neemrana, Bulandshahr, Kanpur, Lucknow, Varanasi, Allahabad, Dehradun, Haridwar, Chandigarh, Shimala, Panchkula, Ludhaiana, Gwalior, Jhansi, Agra & any other location world wide. Light weight aluminum construction ensures easy portability. Special process of super insulation provides lowest evaporation loss with japanees technology. Transport containers are modified with additional supports to suit rough handling conditions, experienced in developing countries. Polyurethane paint ensures long durability. Molded caps and covers provide due protection. We are Exporter and supplier of high-quality INOX cryogenic Liquid Nitrogen Container from Delhi, India. Our INOX cryogenic Liquid Nitrogen Container can be widely used in various organization like laboratories, Ice creme manufacturing, IVF Centre and to store semens straw. These INOX cryogenic Liquid Nitrogen Container can be customized in nature.